Could it be true? Is Simcoe really dead? It’s about damn time, right? On Turn: Washington's Spies Season 4 Episode 8, Abe finally exacts revenge on Col. Simcoe. But the other part of his mission, capturing Gen. Arnold, will have to wait. Gen. Arnold, however, does share with Abe a potential strategic naval mistake, and Abe realizes he has to get back to Washington’s Camp as soon as possible. But before he has the chance to escape, the American Legion troops are headed into another skirmish with the rebels. All the battle scenes were beautifully choreographed, but it was jarring to see a war taking place in such a stunning setting. 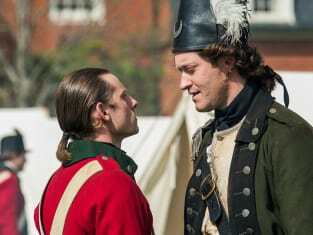 I didn’t think the Culper/Simcoe showdown would happen this week, which makes me believe that Simcoe survives his injuries like the excellent super villain that he is. I was thrilled to see Caleb get his confidence back and hit his torturer with one shot. If Abe couldn't be the one to kill him, I’m glad Caleb got to kill a few of his demons with one good shot. In Washington’s Camp, Mary has become a double agent, and she’s demonstrated yet again why she’s the best spy of the bunch. She finds out her new BFF in camp, Ann, has a direct link to General Clinton in New York. Mary and Anna (they are practically friends now!) want to plant false information. They haven’t run their plan by Maj. Tallmadge, who was fired for telling Gen. Washington the truth about his strategy in New York. 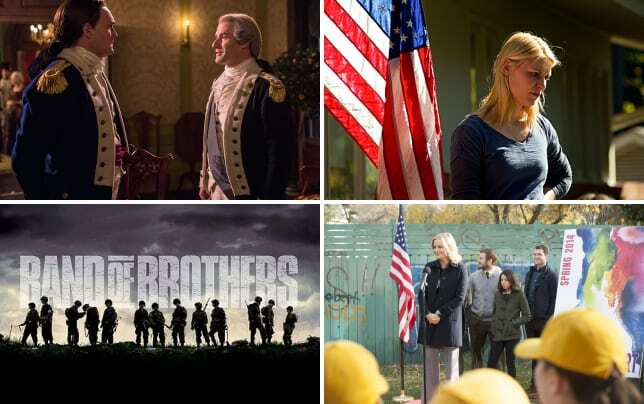 Gen. Washington has two obsessions: Taking New York, and capturing Benedict Arnold. Everyone around him has urged him to take the fight south to Virginia. Washington remains unconvinced. Maj. Tallmadge [to Gen. Washington]: You have been blindsided by self-centered ambition. And it will be my friends who pay the price. C’mon, Ben, no one talks to George Washington like that! His candor may have cost him his job, but now Maj. Tallmadge is free to try to rescue his farmer friend trapped behind enemy lines. Washington has officially lost his man in New York, as Culper Jr. has been exposed and must flee the city. Culper Jr.’s partner, Rivington, discovered him making changes to and copying a book on British naval signals. Rivington may have been genuinely shocked to discover that his partner is working for Washington, but he immediately found a way to use it to his advantage -- by profiting, of course. I almost feel like Rivington wishes he could have been part of the intrigue of war. That guy loves to twist the truth too much, though, and he probably would have ended up as a double agent anyway. Speaking of profiteering traitors, Gen. Arnold has started looting the Virginia countryside between battles. He even asked Abe to help him find buyers or dealers up north who may be able to move his stolen goods. With respect, sir, I am here to fight, not to loot. Permalink: With respect, sir, I am here to fight, not to loot. The bumbling Arnold barely looks up from his desk while “introducing” Col. Simcoe and Pvt. Woodhull. If he wasn’t so self absorbed, he would have noticed the killer looks they were giving each other. How sad to see Mr. comic relief, Pvt. Sturridge, become a casualty of war. But you knew Sturridge couldn’t survive, right? He was affable, anti-war and nice to farmer-turned-spy Abe from the moment he appeared on screen. The self-proclaimed coward turned out to be a very brave soldier, saving his new American friend twice in Virginia: once during his first and last battle, and then finally sacrificing himself as the Brits closed in on their escape plan. Let’s get back to everyone’s enemy No. 1: Col. Simcoe. With Abe satisfied that Simcoe won’t survive, he abandons the American Legion and follows the river up the coast to a French ship. At first he looks relieved to be captured by allies, but soon he’s thrown in with the other prisoners of war. I am Samuel Culper! I am Samuel Culper! Permalink: I am Samuel Culper! I am Samuel Culper! What did you think of this week’s episode? There are only a couple more episodes left, so catch up now here: watch Turn: Washington's Spies online ! Permalink: I was sorry to hear about your father. I am offering 5000 guineas to any man who brings Benedict Arnold down. Permalink: I am offering 5000 guineas to any man who brings Benedict Arnold down.